(2-LP set) There's no underestimating the importance of “Screamadelica,” the record that brought acid house, techno, and rave culture crashing into the British mainstream - an impact that rivaled that of Nirvana's “Nevermind,” the other 1991 release that changed rock. 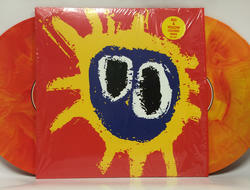 Prior to “Screamadelica,” Primal Scream were Stonesy classic rock revivalists with a penchant for Detroit rock. They retained those fascinations on this LP - one listen to the Jimmy Miller-produced, Stephen Stills-rip "Movin' on Up" proves that - but they burst everything wide open here, turning rock inside out by marrying it to a gleeful rainbow of modern dance textures. Original artwork, red & yellow vinyl.